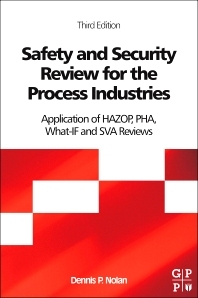 Safety and Security Review for the Process Industries: Application of HAZOP, PHA, What-IF and SVA Reviews, Third Edition, describes the responsibilities, methods, and documentation required for the performance of qualitative hazard analysis for industrial and commercial processes, specifically Preliminary Hazard Analysis (PHA), What-If, and Hazard and Operability (HAZOP) reviews. It is a guideline and reference book that explains how the methodology and procedures used for these reviews can be adopted and applied for Security Vulnerability Analysis (SVA) to avoid the major risks that have the potential to severely impact the industry. Organized into 13 chapters, the book relies mainly on practices commonly observed in the petroleum, chemical, and petrochemical industries. It begins with an overview of PHA, What-If, and HAZOP reviews, including their limitations and advantages. It then moves into a discussion of safety reviews that are increasingly used in the process industries: Bow-Tie Analysis (BTA), Layers of Protection Analysis (LOPA), and Safety Integrity Level (SIL). The book looks at review team members, their qualifications and responsibilities, and senior management support and responsibilities for the safety and security of a facility. The reader is also introduced to review procedures and worksheets, review applications, preparation and distribution of the study report, and handling and resolution of recommendations. The book concludes by explaining the estimation of review scheduling and cost. This book will serve as a reminder to members of PHA, What-If, and HAZOP review teams about their duties and responsibilities. The 4th edition of the book by D. Nolan is a very complete and exhaustive practical guideline for the development of process hazard analysis studies. It also contains many very useful suggestion for the practical organization and facilitation of such studies. Highly recommended to all involved in process haard analysis studies.